The major metro areas where the housing market is cooling include Seattle, Bellingham, Mount Vernon-Anacortes, Bremerton-Silverdale and Kennewick-Richland. For the first time in a year and a half, Washington is no longer the state with the hottest housing market in the country, though not because homes here have suddenly become cheap. Home prices grew faster in Washington than in any other state starting in January 2016 and, after being briefly overtaken by Oregon later that year, this remained the hottest state in the country since December 2016, according to CoreLogic. But the new numbers show Nevada had the biggest home-price increase in the nation in June, with Washington second. Buyers shouldn’t start celebrating much, however. Like in King County, the market statewide is also cooling, but just from red-hot to slightly-less-hot. Home prices in June rose 12.1 percent from a year earlier statewide, down from a 12.8 percent pace the previous month. 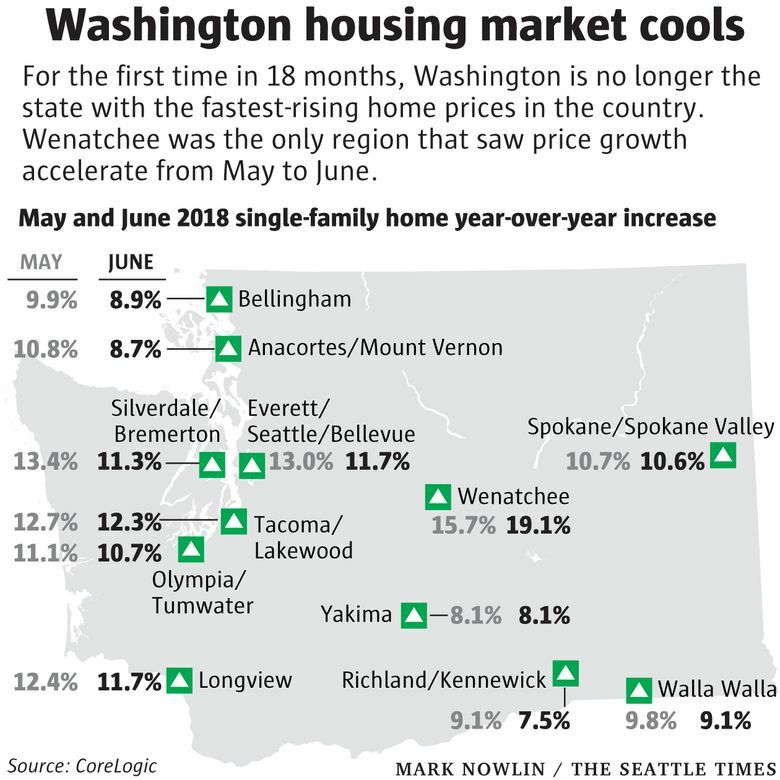 The metro areas that saw home-price growth decelerate by at least 1 percentage point from May to June include Seattle, Bellingham, Mount Vernon-Anacortes, Bremerton-Silverdale and Kennewick-Richland. The only area where the market actually got hotter was Wenatchee. The trend is likely to continue when the statewide numbers for July come out. The Northwest Multiple Listing Service reported last week that home-price growth slowed further, to 8.4 percent, across the region it covers, which spans a bit more than half of Washington counties. King and several other counties saw median prices drop from their spring highs. Nevada overtook Washington by holding steady at 12.6 percent year-over-year growth in home prices. At the same time, Las Vegas is right behind Seattle on the list of metro areas with the biggest price jumps. Nevada is surging in part because it had so much room to climb after being one of the hardest-hit states during the housing bust, when foreclosures swept across the desert. Home prices in Nevada plummeted 60 percent after the bubble burst, compared to a 30 percent drop in Washington, according to Zillow data. Washington (or at least the Seattle area) was much quicker to recover after the recession than Nevada. Nevada remains about $100,000 cheaper than Washington for the typical house. And Seattle is three times more expensive than Las Vegas. 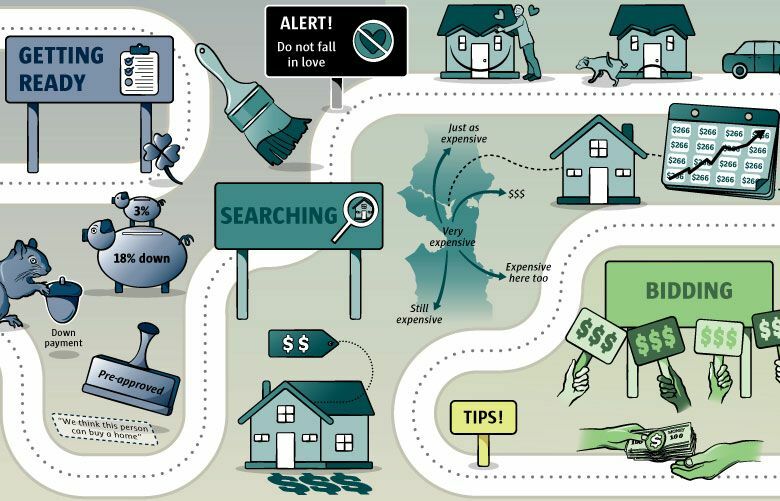 While the Seattle area has grabbed all the attention for its pricey homes, the rest of the state — from Vancouver to Bellingham to Spokane — has been getting much more expensive over the past several years, as well. The median cost of a house statewide was $360,000 as of the first quarter of this year. That’s up 73 percent from when the market bottomed out six years ago, and 20 percent higher than the old bubble peak from a decade ago, according to the Runstad Department of Real Estate at the University of Washington. Of course, the statewide averages mask huge differences within the Evergreen State. If you’re really looking for something cheap, head to Lincoln County, where the typical home costs $100,000 — prices Seattle hasn’t seen since 1988. For more low-budget options, the median house costs $141,000 in Columbia County, $153,000 in Adams County and $157,000 in Ferry County. The second-most expensive place outside King County is not even in commute range from Seattle: In little San Juan County, vacation homes have pushed home values to $475,000 (just ahead of Snohomish County). The counties of Clark, Island, Jefferson, Skagit and Whatcom have home prices ranging from $340,000 to $360,000. The national housing market continues to cool as well. Only two other states are seeing year-over-year home-price growth in the double digits: Idaho, up 11.4 percent, and Utah, up 10.4 percent. The states where home values grew less than 3 percent in the past year are Alaska, Connecticut, Iowa, Louisiana, Maryland, New Jersey, North Dakota, Oklahoma, Virginia and West Virginia, as well as the District of Columbia.